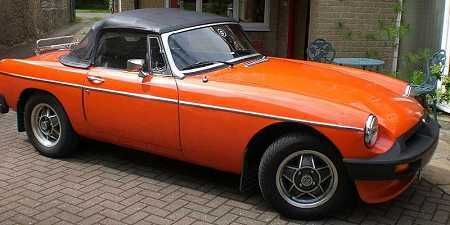 Pictured is the MG B LE (Limited Edition) in vermilion with black interior. This car is one of the last Five Hundred built by the MG Factory at Abingdon. In fact 420 were built, 212 roadsters were fitted with alloy wheels as shown in the photo and 208 with the wire spoke wheels. The car has a registered mileage of 102000 miles, although a new engine was fitted at 65000 miles by the then owner. An engine capacity of 1798 cc gave 97 bhp and a top speed of 104 mph with a 0 - 60 of 14 sec's.. It has four forward speed gears with overdrive fitted on 3rd and 4th gears operated on the gear lever. As a matter of interest MG's were produced at Abingdon for 50 years and the company never suffered a strike.